Me, Myself & Pies was created in 2014 by two brilliant minds, John and Carol Thomas. John, the First Coast Technical College trained Chef since 1990, and Carol the self-appointed Sous Chef/All around greatest wife, put their heads together and formed a fun and modern pie company. 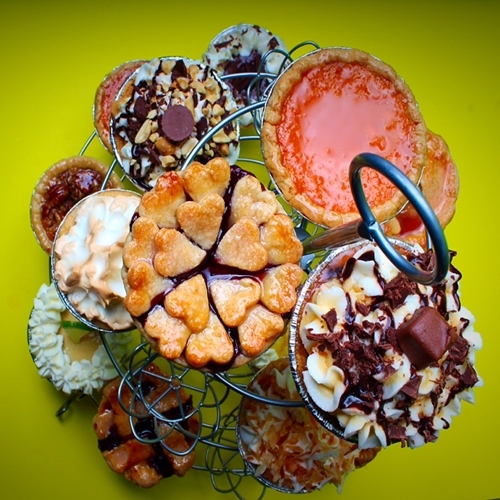 With very few homemade pie options in Jacksonville, Florida; Me, Myself & Pies allows for simple and clean flavors, while still maintaining a deliciously fabulous pie through passed down family recipes. We only use the finest and freshest local ingredients in all of our quiche, pot pies and dessert pies. And of course, a very, very flaky crust. Me, Myself and Pies can accommodate any order, both large and small. We offer local pick at area markets and delivery in the greater Jacksonville area for an additional fee for large catered orders. Our pie company specializes in flaky, fresh, local, organic, simply out of this world delicious quiche and pot pies, as well as custom gourmet dessert pies. Our beef and chicken pot pies come in 6” and 9” sizes. This creamy, savory comfort food is loaded with meats and veggies all in our homemade flaky crust. Our delicious pot pies are a favorite for simple meals and family gatherings – so warm and tasty you won’t be able to resist. Have you tried our quiche lately? Check out the mouth-watering flavors each Saturday and enjoy a wonderful combination of eggs, milk, and cream with savory flavors again all baked in our handmade flaky pie crust. Quiche is a unique option to bring to any gathering. Although Me, Myself & Pies doesn’t have a storefront (yet), you may pick up items at the Fernandina Beach Market Place farmers’ market located on N. 7th Street in historic, downtown Fernandina Beach. Located between Alachua and Centre Streets, the farmers’ market is open on Saturdays, from 9 a.m. to 1:00 p.m., year round, rain or shine. Saturday online orders must be placed by Tuesdays, before 5:00 p.m..
You can always call us as (904) 757-2227 or email us info@memyselfandpies.com. We are an on demand catering pie company with delivery and pick-up options available.